Two months ago I installed the WordPress Plugin called “Crawl Rate Tracker” you can download here. It’s compatible with WordPress 2.6x. 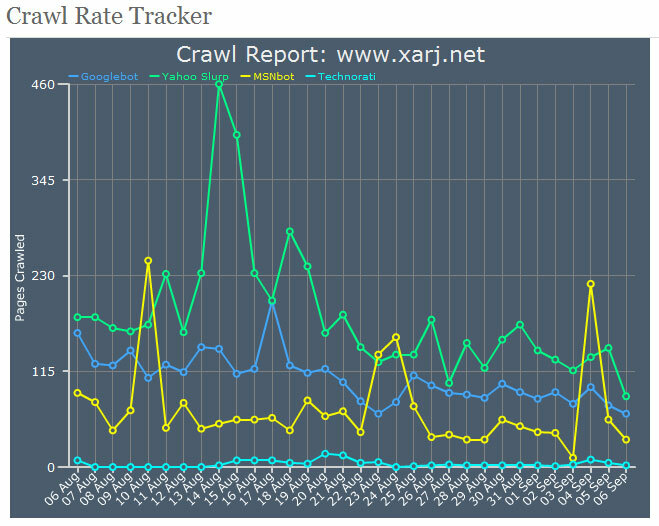 WordPress Plugin Crawl Rate Tracker can identify the bots from Google, Yahoo, MSN and Technorati. As a rule of thumb, the more often a bot comes to visit your site, the more your content is popular and your website successful. Very big and famous websites get lots and lots of visits from the bots hungry to index the latest post and article. The data spreads over one month from August 6 to September 6. Google in dark blue, Yahoo in Green, MSN in Yellow and Technorati in light blue. I’m surprised Yahoo visits my site more often than Google! As I said above, the more a bot visits your site, the more popular you are and I barely get a couple serp listings on Yahoo! Google loves me but I don’t get much love from Yahoo and MSN! Maybe Google’s bot is just smarter and can do more with less visits. It’s impossible Yahoo has more computing power than Google! So I’m surprised the Yahoo bot comes in first position! New content appears pretty regularly on my blog but the data shown on the graph are absolutly not constant and stable! It’s all over the place! Especially for MSN in yellow. Three huge peaks on August 10th, 24th and September 4th. You can also see the humongus peak for Yahoo on August 14th. Weird. I wonder why those peaks occur. Anyone else uses this great wordpress plugin “Crawl Rate Tracker” on their Blog? How do your stats look like? Do you get more than 130 pages crawled per day and per search engine on average?